It was cold. The sun had only just risen high enough to peak over the edge of the mountains and the early morning mist still clung to the slopes. Astrid could barely see ahead more than a couple of feet, but she was untroubled by the lack of visibility. She always wondered how elves and dwarfs could manage with only their eyes to guide them when hearing would often tell them so much more. As soon as she was by the river Astrid undressed down to her underclothes, which were thick and long enough to be considered garments in their own right, and pushed her veil into the water. The icy cold turned her hands red in seconds, but she did not mind. It had been days since she had been able to wash. Every river they passed had been too shallow for her to bathe in. This was the first rock pool she had found in days. The cold was a small price to pay to feel clean. As quickly as she could, she scrubbed the veil over her arms and legs till her skin was like bright red gooseflesh with every hair on end. Jarl and Knud were still fast asleep. Her wolf skin was over Knud to keep him warm, although she was not sure if he just pretended to be cold so that he could wear the enormous fur as much as possible. She did not mind. It made her laugh, and as much as Jarl kept telling him to stop asking so many questions, Astrid enjoyed it. Most of his questions were so ridiculous Astrid could not help but laugh, even if it was just to see Jarl’s embarrassment. Astrid looked up. Though the fog still hid the top of the mountains from view, she was sure that the Salt Monasteries were only a few hours walk away. Only a few hours, a dark voice whispered in her ears, a few hours till they pay you and find a dwarf guide. He doesn’t trust you, remember? He didn’t have a choice, he couldn’t travel back on his own. Awww, are you fond of them? How naively stupid can you be, Astrid. You’re a Goðgá, remember? No, I keep you alive remember. 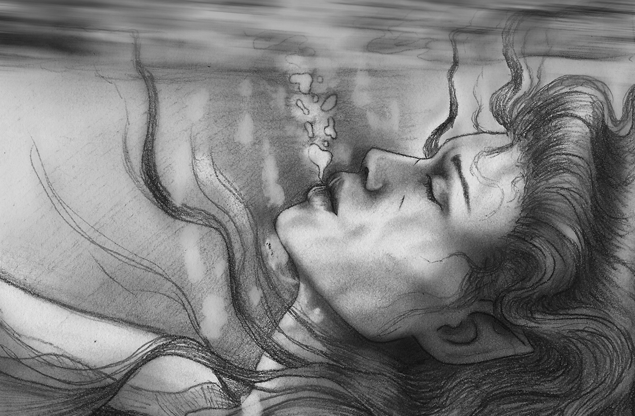 Without thinking, Astrid stepped into the river and submerged herself under the water. The sudden cold forced the dark voice out of her head. Despite every instinct telling her to get out of the water before she froze to death, she held her head under the water till she was sure that the voice was gone. “Look!” Knud shouted and pointed ahead. The monastery was visible for the first time through the fog. “Is that it? Is that it? !” He asked and jumped up and down excitedly next to Astrid. “Yes, it is,” Astrid smiled back, her face dropping slowly. “What’s that smell?” Jarl asked. There was a strange bitter sweet smell on the wind. “What is daru wine?” Knud asked. “No,” Jarl replied instantly. “You’re too young to drink,” he added. Astrid smiled to herself as Knud grumbled. She had spent so many years around human’s and their shorter lifespans that it sounded strange to her that a thirty-year-old dwarf would be considered only just old enough to drink. “Why are you smiling?” Jarl asked. Astrid’s face dropped like a stone. “Knud, don’t say things like that,” Jarl murmured to Knud once Astrid had walked ahead. 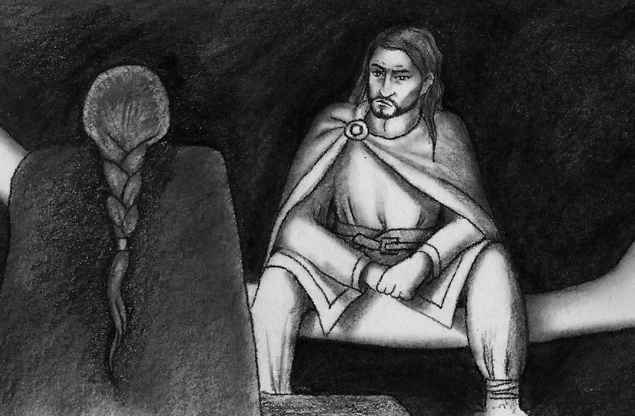 Jarl stopped for a moment and crouched down in front of Knud. 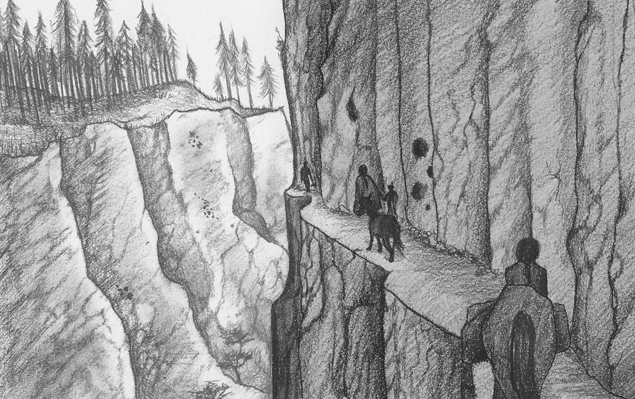 Knud nodded and ran ahead, but when he reached Astrid she kept her face turned away from him. Astrid nodded and motioned at him to run back to Jarl. As soon as he was gone she rubbed at her eyes angrily. Of all the things she had expected Jarl to say, that had been the last. He’s a dwarf. He’s just being kind because he needs you. Just you wait, the dark voice hissed. “Go away!” Astrid whispered again. It took them another five hours to reach the monastery gates. They passed several human traders making their way back down the mountain. Knud was mesmerised by the strange animals they had instead of ponies. “They’re called sand horses,” Astrid explained. “They look weird,” Knud laughed and tried to reach out to stroke one of them as it rode by, only for its human rider to shout at him in a language he could not understand. Astrid quickly pulled him away from the sand horse and apologised to the rider who rode off angrily. “Not to touch it,” Astrid lied. “How many languages can you speak?” Knud asked, fascinated by how strange the language Astrid had spoken in sounded. Behind them Jarl looked up, a shocked and angry look on his face at the mention of Gyaght. “How many languages do they have?” Knud asked again. “Gyaght, that’s one of the goblin languages,” Jarl said suddenly. Astrid’s face dropped. “The vârcolac speak it too, not just the goblins,” she said quickly. Knud looked from Astrid to Jarl and then back again. Astrid flinched at the strange expression on both their faces. “What else can you speak?” Jarl asked, his mouth pressed into a tight line. 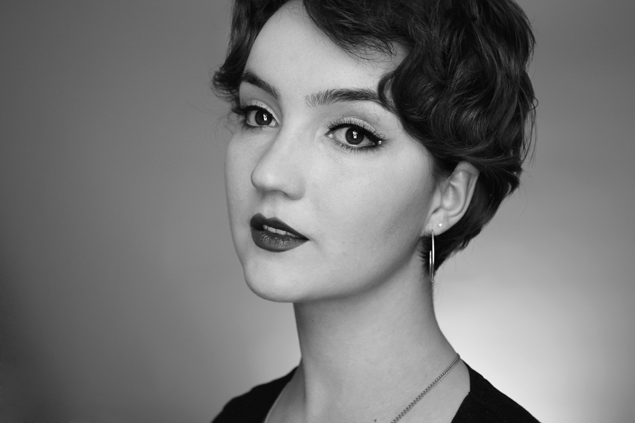 “What do you mean?” Astrid stammered as the dark voice laughed in her ear. Here we go! The dark voice laughed. I told you, go on tell the truth. Prove me right. “Beziickt?” Jarl asked, his eyes narrowed. Instantly Knud let go of her hand and huddled next to Jarl. “Friends? No. Dag ignored everyone, Ragi was the only one who actually took care of me. He was my friend,” Astrid replied, her voice defensive and angry. “Goblins are evil,” Knud mumbled, pushed past Astrid and ran up the path. “Knud?” Astrid shouted after him. “I didn’t mean to upset him,” Astrid whispered. Astrid walked ahead past him and Knud, angry at herself and everyone around her. “Shut up,” She whispered to the voice behind her ear. I told you so, it whispered. “I hate you.” Astrid whispered back. When she reached the outside of the monastery gates, whose closed doors were five times taller than she was and made of a thick red wood, Astrid threw her bag down to the ground and waited for Jarl and Knud to catch up. Now that she thought about it she was angry at herself for enjoying their company so much. Between all the little interested questions they asked and her curiosity she had allowed herself to feel comfortable, accepted even. 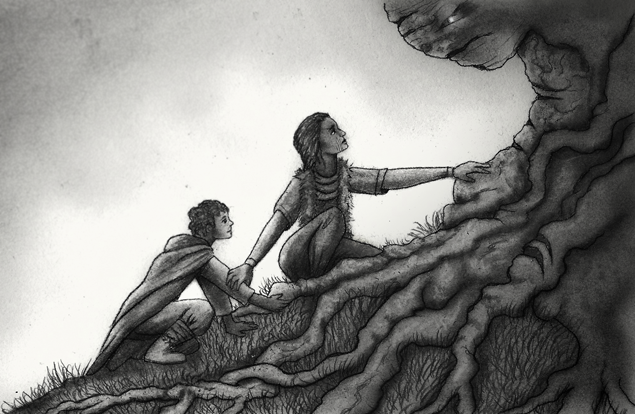 Jarl and Knud reached her and Astrid shoved the bag coins he had paid her in Einn into his hands. While Astrid stared back at him in confusion the tall door behind them opened with a groan. The doors were so heavy it took four monks to open them. “When should we leave?” Jarl asked. Jarl nodded and walked towards the group of monks at the doorway. He gave them several fé to pay for their stay and was surprised when the monks handed him back all but one of the fé and ushered him into the courtyard. Just as Astrid had said, the courtyard was filled with monks pressing bright red berries in large open barrels. Many of the monks stood barefoot in the barrels to crush the berries underfoot before pressing them. Knud stared at them as they walked by. The smell of the berries was bitter, but strangely enticing. Outside the gate Astrid didn’t move for several minutes until she suddenly held her hands over her mouth and hid her face against the wall, her shoulders shaking. “Erin? Is that you?” One of the monks walked over to her and gently rested his hand on her shoulder. As quickly as she could Astrid wiped her eyes and turned to face the monk. Her smile wavered when she saw his hair was a lot whiter than she remembered.